Although I use GNOME 3 as my desktop environment, I prefer KDE’s kwallet service to gnome-keyring for some functions. The user interface is a little easier to use and it’s easier to link up to the keyring module in Python. A few errant mouse clicks caused me to accidentally disable the kwalletd service earlier today and I was struggling to get it running again. The daemon is usually started by dbus and I wasn’t entirely sure how to start it properly. Manually running kwalletd in the console wasn’t successful either. 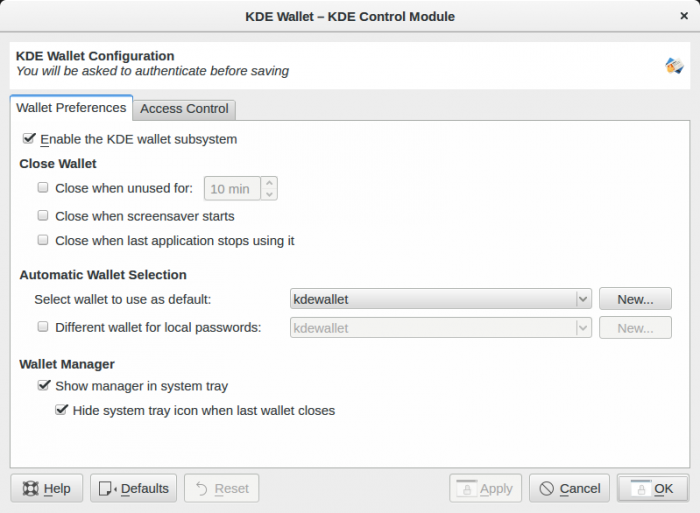 Click on Enable the KDE wallet subsystem and then click OK. Once the window closes, start kwalletmanager and you should be able to access your secrets in kwallet again.